Dixie had more than just a few lessons to teach her master! When Raelene Phillips first spotted her, Dixie Lee was a cuddly furball, sitting on a pillow in a small cage. It wasn’t long before the puppy was whisked to her new home, where she proceeded to warm the hearts of everyone. Chuckle along with the Phillips as you enjoy the canine antics that have delighted them so much. In order to help with training, they immediately bought a “puppy book.” But it never discussed how puppies can T.P. a living room, and it never mentioned how to walk a small dog with a big cow on the other side of the fence. So that book eventually wound up in the trash! The Phillips decided to make their own rules, tailored to a small schnoodle who had stolen their hearts. The late comedienne Gilda Radner once said, “Dogs are the most amazing creatures; they give unconditional love. For me, they are the role model for being alive.” And a great role model Dixie has been. From conquering her fears and enjoying hilarious adventures to accepting the family’s rules and giving comfort, Dixie has taught her mistress a lesson or two along the way. You’ll laugh, you’ll cry, and through it all you’ll be challenged by these heartwarming stories of Dixie - as if she were preaching from the pulpit. Only got through about 1.5 hrs of this one. Written by the wife of a pastor, it tells the story of going to the mall with a friend who is interested in a Sheltie (a breed of dog). Ms. Phillips comes upon a "Shnoodle" puppy and, after multiple trips to the pet store, becomes the owner. 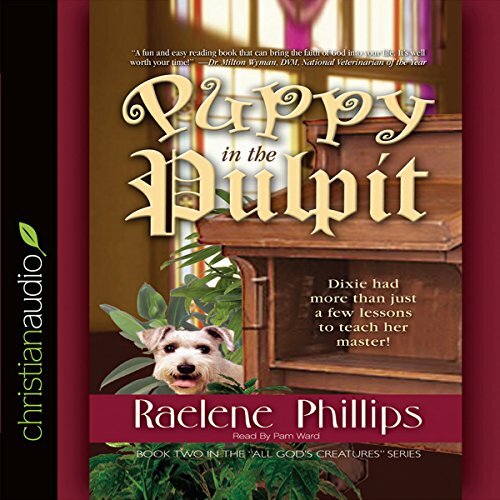 She then tells, in much detail, about housebreaking the puppy, putting a clock in the cage at night, carrying the puppy down the stairs to go to the backyard to do her "business" - all the while drawing parallels with our relationship to God. Millions of dog owners can write a book such as this, and, if they know our Heavenly Father, can draw the same parallels.